It appears that common courtesy is not all that common. How else can you explain the following phenomenon? It’s bizarre to think that in this day and age, that we need to reward our customers for displaying the courtesies in themselves that they expect from us, or those others that serve to do business with them. As a result of this “state of play”, it’s so easy to see that any businesses providing above average, and consistent *Above and Beyond* Customer Experiences and courtesies are going to stand out head and shoulders above those businesses offering only mediocrity when it comes to customer service. An article from October last year came across my desk yesterday. It fascinated me, because of the simplicity of the idea it described. A coffee shop in regional New South Wales, a little over an hour out of Sydney, made Australian mainstream Television and Australian and International Newspaper headlines because of a simple chalkboard sign outside of its front entrance. Welcome to the Seven Mile Beach Kiosk. The article read that the coffee shop was offering its patrons a discount for engaging more pleasantly with its team members. I’d like to say that the coffee shop was extending a professional courtesy, or offering a saving. I find the use of the word “discount” abhorrent. My point though, is that in today’s society, we are forgetting to display common courtesies to those all around us. In this kiosk’s case, the owners have attempted to restore some civility and decency to their day of business, by incentivizing their customers to think before they grunt. How are you grunting at your Dental Office? Are you saying things, or not saying things, to the detriment of your own business and its well being? At my Dental Practice, we went out of our way to make sure that we designed every step of our patients’ experiences and visits around maximising What’s In It For Them. What this meant was that we looked at every interaction to make sure that we as an organisation could maximize our “Please and Thank You” exchanges with our clients and customers each and every time. Not just now and then. And we went out of our way to eliminate computerised automations and other forms of non-human communication that were, by stealth, creeping into our business under the guise of making us more efficient, but at the same time were only achieving in making us less personable. And in so doing, reducing our connection. Our connection with those who matter most to us. I urge you to look at your own office. Are you allowing computers to interact on behalf of humans, when human interaction would be far far more beneficial to your desired outcome? And that outcome is a *Point Of Difference*. Don’t let common courtesies slip out of your office unnoticed. And there’s your Point of Difference. There are some simple numbers that Dental Offices need to know, that a lot don’t know. And if you don’t know them then your blitheringly and blindly stumbling along with your career, your profession and your life, wandering in an aimless direction towards the Holy Grail of retirement. Frankly, if you don’t care about these numbers how can I even believe you care about your family, your future, and even your patients? I am constantly amazed at the large numbers of dentists who don’t have a handle on their numbers. That’s like planning a holiday, but not knowing where you really want to go, and not knowing exactly where you’re starting off from? That sounds incredulous…. but there are people, dentists out there who don’t know these basic bread and butter numbers. 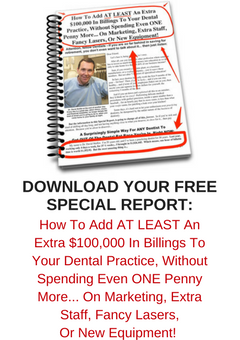 How much income does a new patient bring to your Dental Office? On average, when a New Patient sits in your Dental Chair, what dollar figure are they worth? This is a very nice figure to know. When you know this figure, your office then knows that when the phone rings, and a new patient appointment is scheduled, then we’ve added that amount of money, on average, to the collections of this Dental Practice. So conversely, when the phone goes unanswered, or when an appointment is not scheduled for a New Patient enquiry, we’ve now just taken that New Patient Dollar Value, and ripped it up in front of our very own eyes. Because that’s income we’re not going to get now. At my Office, we knew this number on a year-to-year basis, because we tracked our New Patients *IN DETAIL* so that we were able to assign this value. And assign it a value you must. You cannot guess this figure! How many new patients do you get? By day, by week, by month? This is the fuel that drives your business. You can’t run a successful business without knowing this number exactly. What’s your best month for New Patients? How does this same month compare with that same month from last year? How are this year’s New Patient Figures compared to last year? And what are you going to do about it? A crop farmer knows how many crops, how much wheat, corn, barley he has to plant to bring in how much income for his family. He knows how much, per square foot, each paddock is worth. Yet a lot of dentists don’t know…. When I ask dentists these two simple questions they either don’t know, or they give me round numbers. When I ask how many new patients, they tell me a number ending in zero. These are simply guesses…they don’t know!! What’s a new patient worth? More guesses…. they don’t know!! If I was setting up a Dental Office I’d be setting up right next door to one of these “Don’t Know” Dentists. Because they have no plan.. Stumbling along blindly is no plan. Seth’s Blog: What is customer service for? This is the first time I’ve ever shared someone else’s blog content on this site. But this blog from Seth Godin is so so powerful and is just compelling reading. Seth’s Blog: What is customer service for?. “Customer service is difficult, expensive and unpredictable. But it’s a mistake to assume that any particular example is automatically either good or bad. A company might spend almost nothing on customer service but still succeed in reaching its goals. Customer service succeeds when it accomplishes what the organization sets out to accomplish. Google doesn’t have a phone number, doesn’t want to engage with most users. McDonald’s doesn’t give you a linen napkin. Fedex used to answer the phone on one ring, now it takes 81 seconds for them to answer a call. None of these things are necessarily bad, they’re merely examples of alignment (or non-alignment). Organizations don’t accidentally run ads, don’t mistakenly double (or halve) the amount of cereal they put in the box. They shouldn’t deliver customer service that doesn’t match their goals either. To create a significant competitive advantage by engaging with customers in a way that others can’t or won’t. This is what the over-the-top customer service approach of Zappos did. They went from being a commonplace (you can buy shoes from anyone, we’re anyone) to a customer delight company that happens to sell shoes. Rackspace does the same thing with technical support. To lower expectations and satisfy customers by giving them exactly what you promised, which is not much: This is the model of automated customer service at most big web companies. They’ll do just about anything to avoid an interaction with a human, and they’re clear about this, meaning that they should only end up with customers who are okay with this. To raise expectations and delight customers by giving them way more than they hoped for, which was a lot: This is a truly difficult promise to maintain (Apple did it with the Genius bar, but they rarely surprise there any more). The secret is to find a focus, a budget and a scale where you can actually deploy talented individuals to keep this promise. To dance with customers in an act of co-creation: This is part of 37Signals’ secret. From their book to their blog to their clearly stated point of view about platforms and the way they do business, they invite customers to debug with them in an ongoing dialogue about finding a platonic ideal of utility software. They don’t promise perfect, they promise engagement. Over-inform. Speak with respect. Be clear about the invitation. This is a very special sort of customer service, and companies often think they’re doing this but end up cutting corners and are merely plodding along, disappointing those that would have preferred to engage instead. To diminish negative word of mouth: Many large organizations resort to this, the last step in a sad journey. As soon as a wheel gets squeaky, they grease it. But that’s all they do unless pressed. The problem is that many of your unhappy customers are too busy to get squeaky, they merely go elsewhere, and the ones who you finally do try to help are so pissed off it’s too late. To build extraordinary trust: This is the initiative taken by an institution to do far more than is expected, at a human level, to earn the privilege of serving again. This is the banker who visits you in the hospital, merely because she heard from another customer that you were ill.
To treat different people differently: One way to reward your best customers is to treat the best of them substantially better than others–the word will spread, others will want to join this group, and those in it will be hesitant to switch to a competitor. But if you make that promise, you need to double down on it substantially, continually improving how you treat your favorites. To race with competitors to lower customer service costs just a bit more than they will: This is the current progression we see among industrial titans who see customer service as a cost, not a profit center. When you measure this, you can’t help to want to drive the cost down, and you will do it just a bit faster than your competitors, because to do it too fast is to risk condemnation. Alas, in just about every industry that the internet has sucked the profits out of, we see this cost-cutting race to the bottom. It’s not going to end well. Because you can: This is awfully rare among public companies, but there are many organizations that treat people as they’d like to be treated. Not to grow market share, but because it’s the right thing to do. So it’s clear that good customers with urgent problems left on hold by Fedex is a mismatch between what they built customer service for and what they’re doing with it. And that a busy startup that doesn’t invest as much time as they could in co-creation communication is not serving the goals of the beta fully. On the other hand, the novelist who doesn’t invest time in answering reader mail is probably doing good customer service, since reserving her best efforts to write another great novel is precisely the promise she has made. Obviously, you can mix and match among these options, and find new ones. What we must not do, though, is plan to do one thing but then try to save time or money and do something else, hoping for the results that come from the original plan without actually doing it. Customer service, like everything an effective organization does, changes people. Announce the change you seek, then invest appropriately, in a system that is likely to actually produce the outcomes you just said you wanted. One of the key Ah-Ha Moments that arises out of my one-day workshops is the prime importance of the role that the Ultimate Dental Handover plays in the whole process of treatment acceptance as well as patient retention. I see practices pounding the keypads of their phones dialing patient after patient attempting to re-activate them into an appointment, when the need for this would be greatly reduced if only those practices honed their skills and concentrated on the importance of creating perfect Ultimate Dental Handovers. Patients are not scheduling, and even worse, they are cancelling primarily because our offices are not spending the correct amount of time with them that is needed to ensure they understand the what, why, how and when about the dental treatment they require. Children spell “LOVE”, T. I. M. E.
And our patients spell “CONNECTION” exactly the same way. How can we ever expect our patients to fully appreciate the gravity and importance of the treatment that they require if we are rushing around them? Clicking off handpieces and suction tips. Clanging around with instruments and trays. Opening and closing drawers and cupboards. How can they receive and accept the information about their next visit and all of its importance when the clinical team are in such a hurry to tear down and turn over the treatment room? And when we transfer the patient to the Front Office, are we taking the required amount of time to perform a perfect Ultimate Handover, or are we rushing this important process? Is the Dentist doing the Handover, but really, he just wants to get back down the back to his next patient? Is the Dental Assistant dropping the patient off up front, knowing that down back there’s a room to tear down, and instruments to scrub and bag? And when we get the patient to the front, is the Front Office ready and waiting to receive the patient in the correct manner? Are they with another patient? Are they on the phone? Are they up to their elbows in paperwork and book keeping? The success of the Ultimate Dental Handover is determined by the availability of manpower and resources. Do you have adequate resources and manpower to allow your office to create consistent Ultimate Dental Handovers? Are you trying to save pennies on salaries while thousands of pounds worth of Dental Treatment are leaking out of your office on a daily, weekly and monthly basis? • Large amounts of diagnosed treatment not being scheduled. • Patients cancelling and not returning. • Patients leaving without appointments for necessary treatment. All because our Office is failing to invest in the human resources needed to allow us to create the perfect Ultimate Dental Handover time after time after time. Patients need to know, what treatment they need next, what that appointment involves, what will happen if that treatment is delayed at all, and how urgent that need for treatment is. We need to invest in the time upfront, so that we see the return on that investment in scheduled bookings in our appointment book. That get kept. And that’s it, in a nutshell. The Many Hats Of Business. 35 Questions You Need To Ask Yourself Before Buying A Dental Office..
One of the great skills in owning a Dental Office is the ability of wearing multiple hats. For most of us it’s just enough trying to be a dentist, producing dental treatment for our patients, without being the owner as well, and the responsibilities that go with ownership. There are two hats there. As the dentist, treating patients is what we are trained to do. Create health for our patients. So we wear the Dentist Hat. But as a business owner we need to do a multitude of things. We need to *RUN* the business. It needs to firstly, make a profit and be viable. So we need an Accountant Hat. Making sure that our expenditure is less than our collections. And that we don’t get ahead of ourselves. That we don’t get out and start spending it before we make it. Part of this means we need to be a good stock controller. We need a Stock Controller’s Hat…. Dental inventory. And stationery. And sundries. There are utilities, like phone, water and power. And there’s wear and tear on fixtures and fittings. And what brings patients in the door? I suppose that requires a Marketing Hat? How do I attract a steady stream of new patients into my office? How do I attract the right type of patients? The ones that I would like to be treating? And how do I monitor my marketing spend? Do I need to wear two hats at once? Do I need to be wearing my accountant’s hat and my marketing hat at the same time? What is a new patient worth to the Dental Practice? What is the average two-year spend of a new dental patient? And what is their average spend going forward in years four, five and six? How much should I spend to acquire a new dental patient? And of course, there is the age-old chestnut….who will come and work for me? What are my obligations as an employer? What can I reasonably expect them to do for me? How do I juggle different personalities and manage different people together? Who’s going to pay them each week? Who’s going to guarantee their legal entitlements? And how do I educate my team? How do I teach them better ways of doing things? I guess I need a Training Hat? Don’t they just want to turn up, sit up and get paid up only? How do I improve my own education? Where do I want this Dental Practice to be positioned in five years time? In ten years? In twenty years? As the owner, where do I see myself in twenty years? The trouble is, after all that study, years and years at college, and education, and after all that money invested in buying and in building a Dental Office, sometimes all we want to do is really just cut teeth only? And not have to worry about all the hats?